Work out how you are going to ask your questions. This 'How to' focuses on developing questions for your survey. It has pictures in it taken from an online survey but you can make these same questions in a printed document for a paper survey. Before you read this 'How to' it’s a good idea to read How to create a paper-based survey or How to create an online survey. Because the purpose of the survey is so important to how you write your questions we are repeating this section from the 'How to' on paper and online surveys. What we want to know: is our service meeting people’s needs? Are clients satisfied with the way we conduct assessments? Does the way we do case coordination, support and referral work for them? Do they think we are helping them achieve the outcomes they want? Are there services clients want that we aren’t providing? Make sure the subsequent decisions about who you survey and how your survey is structured relate closely to these basic ideas. What you want to know is your survey purpose and the questions you need to ask are your survey objectives. Survey purpose: to learn whether our service is meeting clients’ needs. Do clients understand why they’re being asked the assessment questions? How did the clients feel about the assessment process? Are clients satisfied with the quality and responsiveness of the case coordination model? Do clients have any feedback for service improvement? Are clients making progress towards, or achieving their goals? What needs do clients report are not being addressed? We hope this example is close to something you know well – that its close to how many community service organisations work. But what if you want to run a survey to find out new information about a topic that you don’t know much about? In that situation you need to do some preliminary research so that you can design your survey. The best way to do that is to do a short survey of a group of relevant people using some open-ended questions (for more on these see section 4 below). The answers you get to this preliminary survey will tell you what you should explore in your survey proper. There are a couple of things you need to avoid when you are thinking up your questions. Give people the chance to choose ‘don’t know’ or ‘neutral’ or ‘not applicable’. 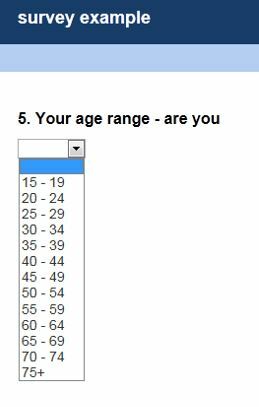 These are the questions at the beginning of the survey which help screen out people who aren’t eligible to take part in the survey. Start with questions that don’t take much effort so that people become more invested in completing the survey. These are the questions that require people to write answers, remember things, analyse things or provide personal information. They are further down the questionnaire. These questions are usually open-ended, or ask for specific information. If you have questions that are personal or might make someone uncomfortable put them towards the end of your survey. Obviously asking about criminal history, trauma or drug usage is sensitive. But asking questions about people’s age, income or educational qualifications can also be considered very sensitive as can asking about exercise or dieting habits. By putting these questions at the end of the survey it is hoped that the respondent will feel comfortable and engaged enough to answer them. There are two different ways you can ask questions in a survey − using closed or open-ended questions. 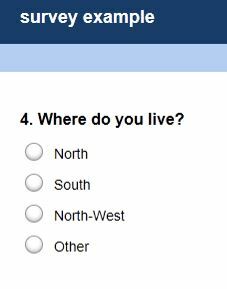 want to look at particular groups among your survey respondents to see how they have answered questions, eg, look at the answers to questions about access from everyone who ticked yes to ‘live in a regional area’. Use these when you want just one answer to a question. Use these when you want just one answer to a question. Use these when you want one answer to a question but you have lots of options and need to save space. Use these when you want to measure the value people give something. Use these when you want to measure the value of a series of items against the same scale. Use a text box when you want to give people the chance to give a short answer to your question or the answer you are asking for is a number. They are limited to about 65 characters. Use this when you want to collect more information. A comment box allows people to write a lot.